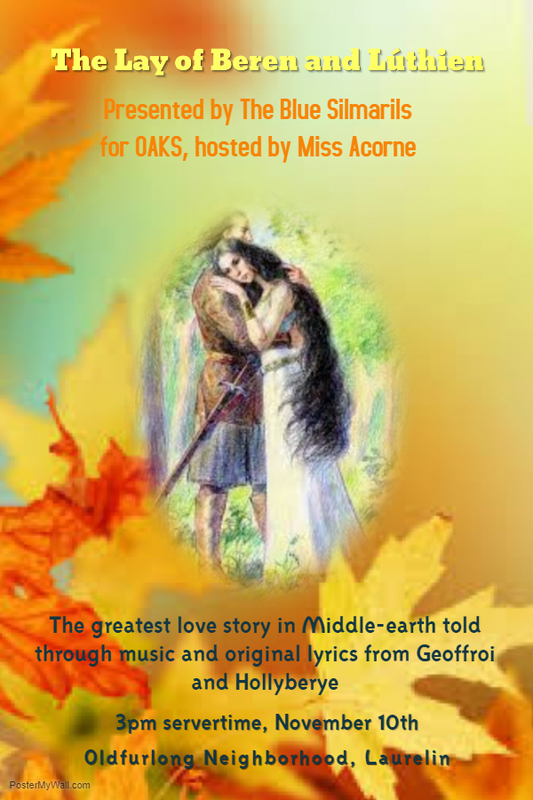 The Blue Silmarils (i.e.Andune) will be performing a special themed concert for the November OAKS (10th) on Laurelin. We have brought together most of the material on Beren and Luthien and tried to create a decent narrative out of it. Set to music of course. I can't tell you how much work this was! Last edited by Keli; Nov 07 2018 at 11:34 AM. The link doesn't work! Where is the concert? Also, my highest lvl character in Laurel in is only level 13. Can someone port me to the concert? Last edited by Iggymojungle; Nov 02 2018 at 11:59 AM. Hello--the location is The Shire Neighborhood of Laurelin...you can ride a stable pony there from Michel Delving. The neighborhood is Oldfurlong, just go on down to the town centre in the middle of Oldfurlong--around the Party Tree and picnic benches. But if you have any issues, ask in Regional chat of The Shire. It will be very safe for all levels. Removed link as Lotro Artists is down. Information you need is on poster - Saturday November 10, 3pm servertime, Oldfurlong neighborhood, Laurelin. Hope to see you there at this unique event! Oh, I have to write this down so I don't forget! Can't wait to see what music you chose.